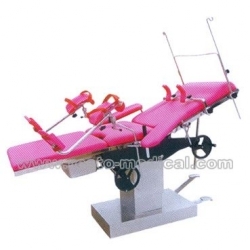 RT50208 table can be used for prenatal examine, maternity childbearing, dystocia surgical and curettage gynecologic surgery. This table is raised and lowered by the hydraulic pressure, the front and back lean, backboard fold is the worm, gear, rack structure. Various actions can be adjusted in the right scope and easy to operate. The leg board can be disassembled. All the outside cover and ordure basin are stainless steel, it is specious and easy to clean.